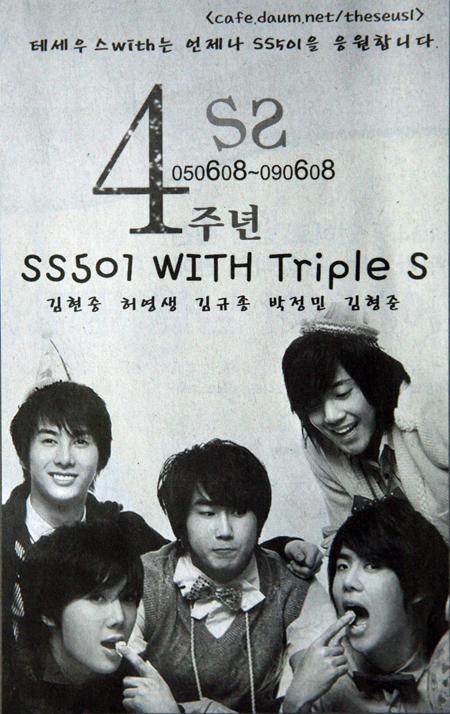 Fans of 5-member group SS501 posted up newspaper ad to congratulate the group on their 4th anniversary since their debut. Their offical fan club Theseus had posted the advertisement posting on 8th June on the daily newspaper – there was congratulation message together with a photo of the SS501 members smiling happily together. Previously SS501 Kim Hyun Joong fans also posted up advertisement posting for completing his drama ‘Boys Over Flowers’. Meanwhile, members Kim Kyu Jong and Kim Hyung Joon are promoting for MBC drama, while members Heo Yeong Saeng and Kim Hyung Joon are promoting as DJ on SBS Power FM.